Deficiency of blood causing hair loss, alopecia, patch balding with shiny bald spots, loss of other body hair, premature graying of the hair, spontaneous and nocturnal emissions, soreness and weakness of the lower back. 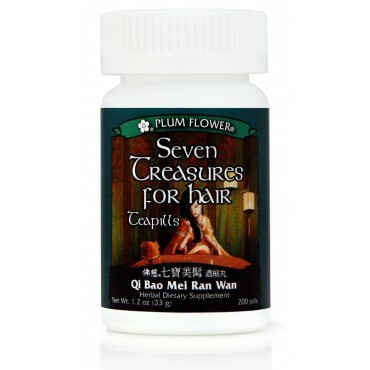 Applicable for hair loss due to childbirth, low thyroid (hypothyroid), chemotherapy or radiation. Blood deficiency causing dizziness, insomnia, fatigue, soreness in the muscles and limbs and poor concentration are some of the imbalances satisfied clients have used this product for. Tonifies Liver and Kidneys, Nourishes Yin, Nourishes and Invigorates Blood, Tonifies Qi, Replenishes Jing Essence, Benefits the Tendons and Bones. Polygonum multiflorum root, Angelica sinensis root, Lycium barbarum fruit, Achyranthes bidentata root, Poria cocos fungus, Cuscuta chinensis seed, Psoralea corylifolia fruit, Activated carbon, Botanical wax, Talcum. - He shou wu, Dang gui, Gou qi zi, Huai niu xi, Fu ling, Tu si zi, Bu gu zhi, Activated carbon, Botanical wax, Talcum. Contraindicated during pregnancy. Contraindicated during the early stages of acute infection or illness, such as cold or flu. Use with caution in Spleen deficient individuals with a tendency to loose stools, diarrhea, poor appetite or chronic digestive weakness. Contains soy.